So Cow is one of those bands that I've heard friends chattering about for a while now. For one reason or another I had just never gotten around to picking up any of their records. Even though I buy way too many records, I don't have enough money to buy every record. Anyway, when I started hearing about this new release of theirs and how it was even poppier and cleaner than their past records, I decided it was time to take the plunge. Luckily, I decided that earlier enough to still snag the limited white vinyl version. 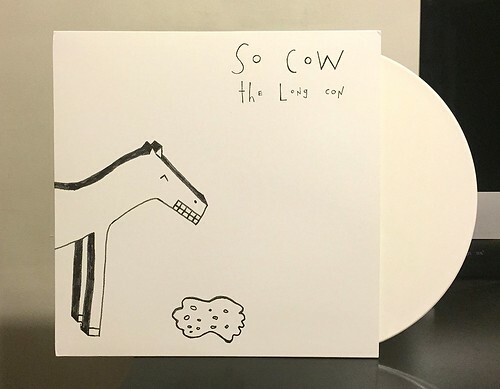 If there was one band that So Cow really reminds me of on The Long Con it's W.H. Walker. Both bands have the same jangle-y guitar up front that bursts into fuzz at just the right moments. Plus both bands sound like they're having a hell of a fun time recording their albums. The bouncy rhythm provide an electric foundation to pile on all sorts of upbeat vocals and guitar pyrotechnics. The whole album is just full of song after song of incredibly catchy hits and I just can't help but think that if any of their prior albums are even half as fun as The Long Con, I've been depriving myself of some great tunes. I'm really glad I pulled the trigger on So Cow. I could have just as easily kept putting them off, but then I would have absolutely missed out of one of 2014's best.